At the invitation of Foreign Minister Makhdoom Shah Mahmood Qureshi of Pakistan, State Councilor and Foreign Minister Wang Yi will pay an official visit to Pakistan from September 7 to 9. Q: The ROK government's special delegation visited the DPRK. The agenda for the DPRK-ROK summit was nailed down during their talks with Chairman Kim Jong Un. Chairman Kim Jong Un expressed his strong will for achieving denuclearization and the willingness to cooperate with the United States. What is your comment? A: We have noted relevant reports. We welcome the second DPRK-ROK summit which will be held in the middle of September. As a close neighbor to the Korean Peninsula, China always welcomes and supports the efforts made by the DPRK and the ROK, which are parties directly concerned to the Korean Peninsula issue, to maintain dialogue and contact, continuously promote reconciliation and cooperation and seek to realize the denuclearization and lasting peace of the Korean Peninsula. We hope that the DPRK-ROK summit in Pyongyang can be held smoothly and achieve positive outcomes and steps can be taken in the right direction of advancing the denuclearization of the Peninsula and establishing a peace regime on the Peninsula in a coordinated way, thus moving forward the political settlement process of the Peninsula issue. The Chinese side is willing to continue with its positive and constructive role in this regard. Q: The President of Nauru said that China should apologize for the behavior of its delegate at the Pacific Islands Forum (PIF). Does China plan on apologizing? A: Like I said yesterday, Nauru staged a despicable farce regarding the Pacific Islands Forum (PIF). What Nauru claimed is completely inconsistent with the facts. It is nothing but confusing right and wrong and blame-shifting. Actually, it is Nauru's wrong words and deeds that make the leaders of many PIF members feel disappointed. It is Nauru who should reflect on its behavior and apologize. I want to admonish Nauru and the "directors" behind this farce that they should stop making trouble out of nothing and inviting humiliation in the face of the broad historical trend of the one-China principle. Q: Just now you announced that State Councilor and Foreign Minister Wang Yi will visit Pakistan. We know that not long ago, the general election was held in Pakistan and the new government has just assumed office. Could you tell us the main considerations and specific arrangements of State Councilor and Foreign Minister Wang Yi's visit to Pakistan at this point? A: China and Pakistan are all-weather strategic cooperative partners. Our two countries are good neighbors, good friends and good brothers. China-Pakistan ties always maintain a sound momentum of growth as evidenced by frequent high-level exchanges and smooth progress in practical cooperation across the board. What needs to be mentioned is that fruitful outcomes have been reaped in advancing the China-Pakistan Economic Corridor. Like you said, not long ago, the general election was held smoothly in Pakistan. A new President was elected and the transition of the government was completed in a steady manner. President Xi Jinping and Premier Li Keqiang have sent messages of congratulations to President Arif Alvi and Prime Minister Imran Khan respectively. At the invitation of Foreign Minister Qureshi, State Councilor and Foreign Minister Wang Yi will pay an official visit to Pakistan. During the visit, besides holding talks and a joint press conference with Foreign Minister Qureshi, State Councilor and Foreign Minister Wang Yi will meet with the major leaders of Pakistan. Our two sides will exchange views on bilateral relations and the international and regional issues of mutual interest. State Councilor and Foreign Minister Wang Yi's visit is the first high-level visit between China and Pakistan after the new Pakistani government took office. We hope that our two countries, through this visit, can renew our traditional friendship, promote mutually beneficial cooperation in various areas and elevate the China-Pakistan all-weather strategic cooperative partnership to a new high. Q: A British navy ship sailed near the Xisha Qundao the other day. What is China's reaction to it? A: On August 31, Britain's HMS Albion-class landing platform dock entered China's territorial sea of the Xisha Qundao without the Chinese government's approval. The Chinese navy identified and verified the British warship in accordance with the law and warned and expelled it. The Xisha Qundao is an inherent part of the Chinese territory. In accordance with the Law of the People's Republic of China on the Territorial Sea and the Contiguous Zone, the Chinese government promulgated the baseline of the territorial sea of the Xisha Qundao in May, 1996. The relevant behavior of the British warship violated the Chinese law and relevant international law and infringed upon China's sovereignty. China is firmly opposed to this. We have lodged stern representations with the British side and expressed our strong dissatisfaction. 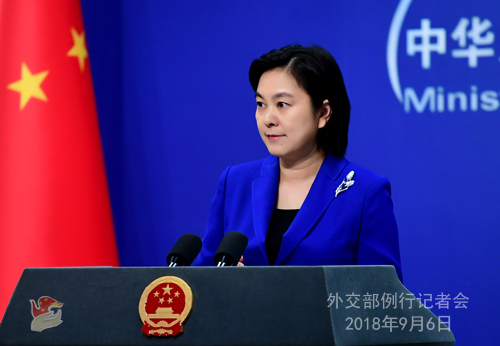 The Chinese side strongly urges Britain to stop this kind of provocation lest it should undermine the overall picture of bilateral ties as well as regional peace and stability. China will continue to take all necessary measures to safeguard its sovereignty and security. Q: According to reports, recently, a raid by the Kenyan police involved a Chinese media outlet in Kenya. What is your comment? A: The Kenyan police carried out a raid on illegal foreign workers on September 5 in which they took away several Chinese journalists and staff members of Chinese-invested organizations who have legal documents. After learning this situation, the Chinese Embassy in Kenya immediately lodged representations with the Kenyan leadership, and all the involved people have been released on that day. The Kenyan side apologized to China for its improper law enforcement behavior and promised to strengthen management of its grassroots police officers as well as law enforcement norms and etiquette to avoid a recurrence of such an incident. We have learned that this raid was part of the Kenyan police's operation to crack down on illegal immigrants. It is not targeting or limited to Chinese nationals. 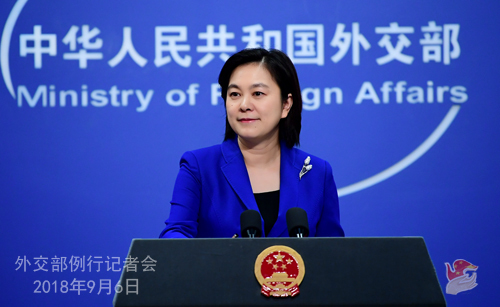 The Chinese Foreign Ministry also wants to avail itself of this opportunity to alert Chinese nationals overseas to properly go through legal procedures for their local business and residence in strict accordance with laws and regulations. Q: The Fourth Eastern Economic Forum is scheduled to be held in Russia's Vladivostok from September 11 to 13. The Russian side has said that Chinese President Xi Jinping will take part in this Forum and hold bilateral meetings with Russian President Putin. Can you confirm this and give us some details? A: You know that China and Russia are high-standard Comprehensive Strategic Partners of Coordination. Our two countries enjoy a very good relationship and our leaders maintain close high-level exchanges. China attaches high importance to this Forum and supports Russia's hosting of this event. 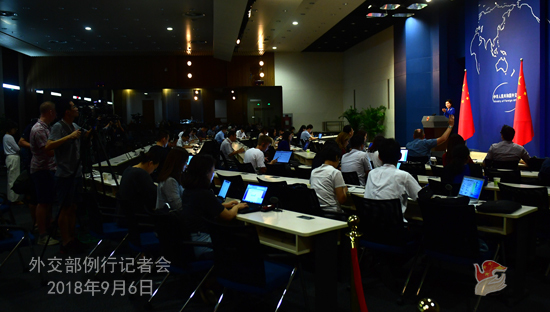 China has sent high-level delegations for the previous Forums. We will release the relevant information about this year's attendance soon.